Alderman George Cardenas is hosting his 12th annual Bike the 12th Ward on June 20th. The event, previously known as Bike the Boulevard, is free and open to the public. Adults and children eleven years and older are invited to bike throughout scenic McKinley and Brighton Park neighborhoods. Participants will be joined this year by Slow Roll Chicago, a Chicago neighborhood bike alliance. The ride will start at the McKinley Park Field House, heading west on Pershing Rd., north on Albany to 35th St. heading east to Archer where the route will turn south on Paulina and head east on Pershing, ending at McKinley Park at 2210 W. Pershing Rd. The riders will then enjoy a free lunch and free samples and games from local vendors. 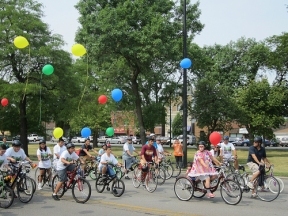 “I started this event years ago in an effort to bring our community together for a day of exercise and fun,” said Alderman Cardenas, “it is my hope that by changing the bike route to go through the local residential streets, it will further encourage members of the 12th ward community to be active and strengthen the community bond we already have”. Registration begins at 8:30 am with the bike ride kicking off at 9:30 am.